The Larson Electronics EPL-48-3L-LED Explosion Proof LED Light Fixture is United States and Canada approved Class 1 Division 1 & 2 and Class 2 Division 1 and 2 for areas where flammable chemical/petrochemical vapors, gases and/or pulverized dust and fibers exist or have the potential to exist. This explosion proof LED light has a T6 temperature rating and carries a paint spray booth light certification, making it ideal for applications such as paint booths, oil rigs, offshore applications, petrochemical, manufacturing, chemical storage, water treatment centers, and food processing plants. This 4 foot long 3 lamp LED fixture is ideal for operators seeking a top quality explosion proof light that will reduce operating costs, improve lighting quality and reduce downtime incurred from frequent servicing intervals. The EPL-48-3L-LED is equipped with Larson Electronics’ specially designed LED T-series bulbs which produce 10,500 lumens, resulting in 30% more foot candles of illumination at 8 feet as compared to standard T8 lamps when measured with an Extech light meter. Our LED-T series bulbs are visibly brighter than standard T8`s and have consistently surprised many of our customers with their unexpectedly high light output levels. We have replaced four 8 foot dual lamp T8 fixtures in our own facility with our LED T series lamps and produced more illumination in the work area with only one 3 lamp 4 foot long LED fixture. We now offer our second generation LED tube lamps with this fixture which have increased this hazardous location light’s performance. This three lamp explosion proof LED linear fixture is lighter in weight, has a slimmer profile, and produces more light than traditional explosion proof fluorescent fixtures. The four foot long LED tube design bulbs included with this unit are rated at 50,000 hours of service life, which is over twice as long as standard T8 bulbs. The 28 watt LED lamps produce 30% more illumination than standard T8 bulbs while offering lower amp draw and increased reliability. Each lamp produces 3,500 lumens at 125 lumens per watt, for a combined 10,500 total lumen light output. 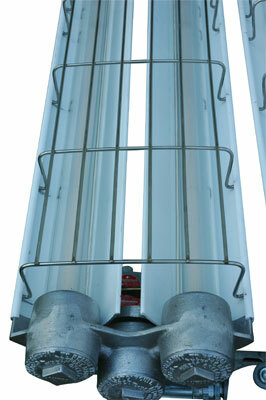 An EPL-48-3L-T8 explosion proof fluorescent light, with a combined total of 84 watts, draws 1.07 amps at 120 volts AC. This LED version of the same light, with a total of 84 watts, draws only 0.93 amps at 120 volts AC. The EPL-48-3L-LED is universal voltage, not multi-tap, and operates on any voltage from 120V to 277V AC 50/60hz without any modifications. We also make a 12/24V AC/DC version for low voltage applications for AC or DC power. Our EPL-48-3L-LED LED light fixture is U.S. and Canada approved for use in paint spray booths. Please note, according to the NEC, using threaded rigid pipe does not require additional seal offs with this fixture. An EYM and seal off is necessary for flex conduit or other non-rigid pipe implementations. Mounting: Standard end mounting via Unistrut. The Unistrut is attached to our standard L-bracket mounts. These L-bracket mounts can be adjusted to create angle mounts. As illustrated in the photos above, the series of mounting holes at the top of the bracket enable this explosion proof LED light to be attached to any wall, ceiling or floor surface. A simple through bolt can be used to secure the light to the surface. A single junction box at one end of the light is provided for the electrical connection. Suspension Mounting: Pendant mount fixtures hang from the ceiling and are suspended by rigid pipe. Each fixture features a 1/2” NPT junction box on one end, and a 1/2” NPT bracket on the other end of the fixture. Operators bring rigid pipe down to the threaded mounting hubs. Wiring is fed down through the rigid pipe to the junction box and tied in to the fixture’s lead wires, completing the electrical connection. 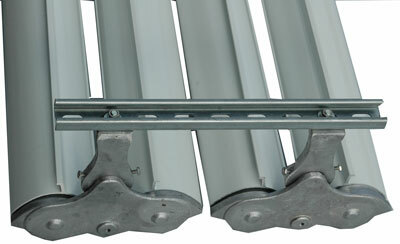 The threaded mounting bracket provides support for the opposite end of the fixture. 4. No ballast box. No ballast to replace. .